Stephen Kaufman, Product Officer for BlueSoftware LLC Inc., is an engaging speaker featured at many technology and consumer brand conferences around the world. He is a visionary leader able to connect technology enablers to real business challenges in listerner-friendly ways. He is passionate about brands, 3D, AR, VR, and automation tools and is helping to create a new vision for enterprise brand experience in the digital age. 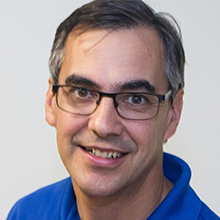 In his current role, Stephen directs the product roadmap and technical strategy for BlueSoftware, addressing such pressing client business issues as packaging globalization, efficiency through metric driven measures, process design and execution, supply chain integration, process automation and technology integration package, label and e-commerce delivery. Stephen has been working on the CPG and Pharma industry sector for 25 years. He founded Bluesoftware in 1997 while at SGK Inc. and has held a number of technology leadership positions, pioneering the development of the first digital asset management system designed specifically to meet the stringent requirements of the consumer products packaging sector. Today, this product is marketed under the name BLUE, and continues to be implemented globally by industry giants in consumer products, retailing and life sciences such as Unilever, Coca-Cola, Walmart, Johnson & Johnson, Con Agra, Kroger and many others. Stephen was a founding member and three-term Chairman of the Intelligent Packaging Consortium. He received his degree in Political Science with a concentration in Information Technology from Northwestern University. Stephen lives in Saint Charles, IL with his wife and three daughters.